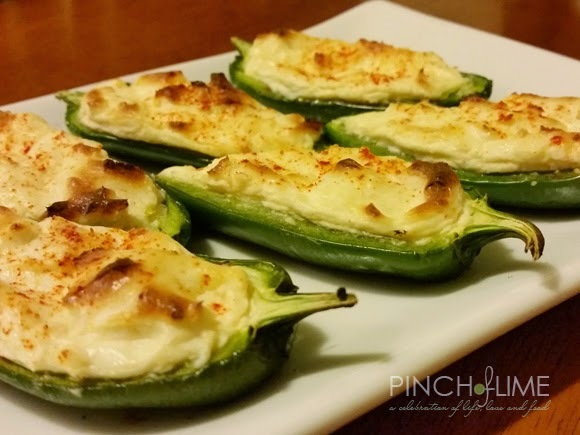 My husband and I are big fans of jalapeño poppers. It's been quite awhile since we had them though because the fried goodness just isn't good for you. Tasty? Oh yeah. But to eat a lot of them is just soooo not gonna happen around here. 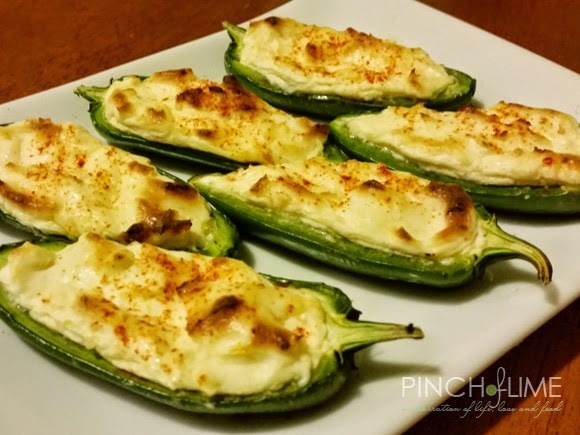 I really wanted some one day though and, well, when you have jalapeños laying around and some cream cheese in the fridge, the only logical thing is to use them together to feed that craving. But I didn't want them in the traditional sense. I wanted them healthier. And that meant no breading and no frying. I've done the baked version with them breaded before, but the taste is usually to 'breadcrumby' for me. (Yes...breadcrumby is now part of my vocabulary.) So this time, they went in the oven naked. Nothing on the outside. Just the pureness of the pepper and the cheese. And well, a few extras for some gooey-ness. Because gooey-ness is just awesome. So, enjoy these in all their deliciousness and nakedness. 2. Cut jalapeños in half lengthwise. Using a spoon, scrape out the seeds and membrane. Place on parchment lined baking sheet. 3. Mix remaining ingredients together and fill each jalapeño half with some of the cheese mixture. Sprinkle with a little extra paprika for garnish. 4. Bake for 15-18 minutes or until cheese is golden brown and bubbly.